Touch User Interface - Touch Screen and Multi Touch: Capacitive Touchscreen Technology and GPS: The Future is at Your Fingertips! Capacitive Touchscreen Technology and GPS: The Future is at Your Fingertips! The author claims that capacitive touch screen technology is a right tool to improve the usability of GPS devices . In my opinion, however, it is not so easy for capacitive touch to beat popular resistive touch screen technology. 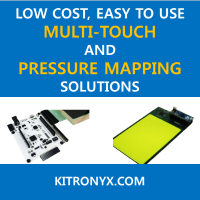 Resistive touch screens are much cheaper and most GPS device companies are trying to reduce the manufacturing cost. R. Parr, “Capacitive Touchscreen Technology and GPS: The Future is at Your Fingertips!,” Chip Design Magazine.